Science never sleeps: Starting this month, the Solar Wind Around Pluto (SWAP) and Pluto Energetic Particle Spectrometer Science Investigation (PEPSSI) instruments join the Student Dust Counter (SDC) in collecting data during hibernation. NASA’s New Horizons, now almost 24 times as far from the Sun as the Earth is, is back in hibernation, a slumbering state in which it will remain until January 2013. But hibernation aboard the spacecraft isn’t quite what it used to be. Starting this month, New Horizons – the first emissary to Pluto and the third planetary zone of our solar system, and fifth spacecraft to explore the outer heliosphere – has been given a “go” from mission managers to start collecting data on interplanetary space during its long hibernation periods on the way to the Pluto system. That means that New Horizons is now working while it sleeps, gathering new information in a region of space that’s rarely visited by spacecraft. After launch in January 2006 and a gravity assist from Jupiter in February 2007, New Horizons entered the “deep cruise” phase of its mission, which lasts until Pluto encounter operations ramp up in summer 2014. New Horizons then begins the encounter in January 2015 and makes its closest approach to Pluto on July 14, 2015. New Horizons spends much of deep cruise in hibernation – essentially long stretches of electronic slumber in which many of the spacecraft’s subsystems (such as science instruments, navigational star trackers and most flight electronics) are turned off to extend their life, and the craft is spin-stabilized to minimize thruster usage. The original New Horizons project plan called for only one instrument – the Student Dust Counter (SDC) – to be powered during hibernation, allowing it to collect information about dust in the interplanetary medium as the spacecraft zoomed across the solar system. Designed and built by students at the University of Colorado in Boulder, SDC is now the farthest-reaching dust detector ever sent into space, making new observations with each passing day. While New Horizons hibernates, SDC measures dust impacts as it plunges through the solar system’s dust disk and sends these measurements back to Earth from more than a billion miles away. “This information allows us to characterize our solar system’s dust disk, helping us unlock mysteries of dust disks in other solar systems at the outermost reaches of the observable universe,” says Jamey Szalay, a University of Colorado graduate student and the SDC instrument lead. 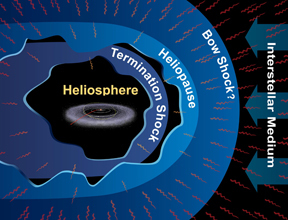 But early in deep cruise, New Horizons Principal Investigator Alan Stern, of the Southwest Research Institute in Boulder, recognized that unique and exciting heliospheric science could be enabled by keeping two other instruments on during hibernation: the Solar Wind Around Pluto (SWAP) and Pluto Energetic Particle Spectrometer Science Investigation (PEPSSI). SWAP and PEPSSI are far more modern and powerful devices than their 1970s-vintage counterparts on the Pioneer 10 and 11 and Voyager 1 and 2 spacecraft that also traversed deep space between the giant planets. These instruments can measure the charged particle radiation environment along New Horizons’ trajectory, sampling solar wind protons (traveling from the sun at about 400 kilometers per second, or about 1 million miles per hour), pickup ions (created by solar wind protons and solar photons interacting with neutral hydrogen from the interstellar medium), heavy ions (ions heavier than helium), suprathermal ions (which travel faster than the solar wind), and other particles. "It's been more than 30 years since we've had a spacecraft venture beyond Saturn, and it's the first time we've had observations from this region while having supporting measurements both farther out [from Voyager 1 and 2] and closer to the Sun [missions at Mercury, Earth and Saturn],” says Matthew Hill, PEPSSI instrument scientist from the Johns Hopkins University Applied Physics Laboratory in Laurel, Md. “Events associated with solar flares and coronal mass ejections that propagate through the solar wind plasma can now be observed throughout the heliosphere as never before. With solar activity on the rise, the timing is great to have these state-of-the-art New Horizons instruments observing the heliosphere." With the chance to collect this valuable data in mind, and realizing it could be decades before another spacecraft crosses the region, the New Horizons project decided in 2009 to investigate operating SWAP and PEPSSI during hibernation. After careful study, the project and NASA judged it was possible to do without degrading the instruments’ capability to support the Pluto encounter in 2015. Still, New Horizons would need to maintain sufficient power, data storage and on-board fuel margins during hibernation, and mission operators could only request a modest increase in NASA Deep Space Network (DSN) resources to downlink the extra data. The team also needed to verify that the three instruments would not interfere with each other or the spacecraft if they all operated simultaneously during hibernation. “After all, we didn’t want to make SWAP’s and PEPSSI’s gain to be SDC’s loss!” Stern says. To address all these issues, the mission team conducted several analyses and ground tests, followed by a 10-day, three-instrument test on the spacecraft in October 2011, while New Horizons was actually in hibernation. Encouraged by the results, Principal Investigator Stern gave a preliminary “go” for a longer, enhanced hibernation cruise science test. 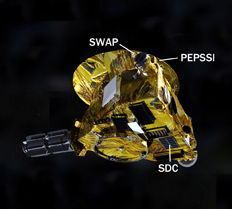 For 80 days, between January and April 2012, more extensive testing confirmed that SDC, SWAP and PEPSSI could all collect excellent data while operating together during hibernation without any problems. When the New Horizons operations team placed the spacecraft back into hibernation on July 6, having wrapped up a 10-week annual systems and instrument payload checkout that included a comprehensive and successful rehearsal of the most intense segment of its Pluto flyby, it did so in the new “Hibernation Cruise Science” mode, with SDC, PEPSSI and SWAP collecting data every day.